Strong tubular steel frame with sprung retractable 75mm diameter rubber tyred swivel castors. Castors provide easy mobility when unloaded, when body weight is applied castors retract and the step remains firmly in place on rubber feet. Slip resistant treads, with high visibility yellow clamps. Platform working area 400mm x 300mm. Choice of red or blue epoxy power coated finish. 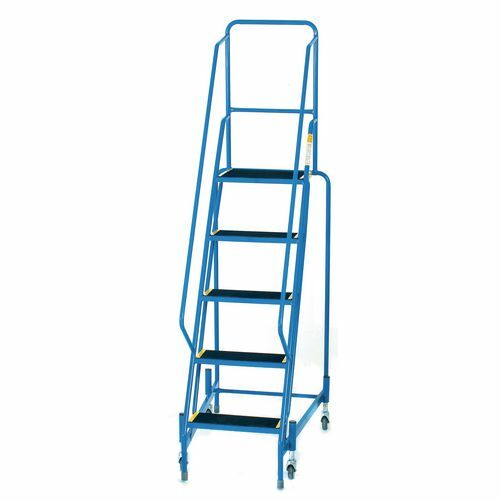 Manoeuvrable steps are ideal when they require to be used in several different locations in a workplace. Our retractable wheel mobile steps with ribbed rubber treads offer a great solution allowing the user to easily transport the steps around an area. They have ribbed rubber treads which provide excellent underfoot grip, helping the user feel more secure while working at height. The strong tubular steel form makes the product durable; sprung retractable 80mm diameter rubber tyred swivel castors provide easy mobility when unloaded and they retract when body weight is applied making the step remain in place. 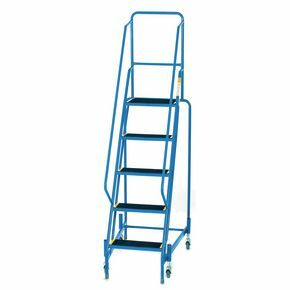 They are available in a choice of red or blue epoxy coated finish and a choice of five platform heights; 500mm, 750mm, 1000mm, 1250mm or 1500mm. The 500mm platform height comes with a choice of a single handrail or a full handrail and the remaining heights come with a full handrail. Our retractable wheel mobile steps with ribbed rubber treads offer an easily moveable and safe set of steps and they come with FREE UK Delivery.